Amazing sage-orange-butter basted turkey, in less than 1.5 hours! Beep! beep! This turkey could almost be a roadrunner it’s so fast. 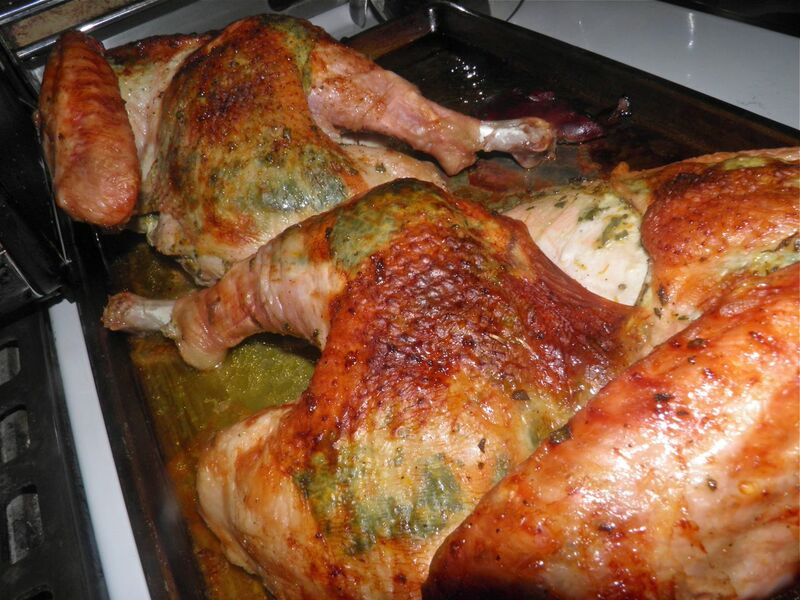 Imagine a 4.5 kg roasted turkey that’s ready – from the oven – in about 1 hour 15 minutes. That's how long mine took. It’s still one week before Thanksgiving, and if you’re intimidated by the usual long roasting time of making the required main dish I’ve taken care of that. So go out and buy that bird, resting assured that you won’t be chained to the kitchen. The secret – if you can call it that – is in “spatchcocking” the beast. Spatchcock is one of those words thats meaning has changed from being a noun to a verb. Originally, a spatchcock was a juvenile chicken or game bird. These birds we generally butterflied for much faster cooking than if left whole. I have done it a few times (see recipe links above). Today, spatchcocking (butterflying) is removing the backbone from poultry and flattening the breastbone by firmly pressing it down with your hands. In this way the meat is all of fairly even thickness and will cook in the same time. Poultry is notorious for having dry breast meat and undercooked dark meat. This technique minimizes that problem. When you look at the pictures you will see mine is in two pieces. That was an unfortunate circumstance of not being in my own kitchen. I had it beautifully spatchcocked but I did this at my mother’s house... with her bakeware. When the time came to put the flattened turkey in a pan I couldn’t find one large enough. So I finished the cut through and roasted it in two halves. The principle is the same. Of course this technique does not bring a turkey in all its glory to the table, but the sage herb butter can be just as easily used on an uncut bird. 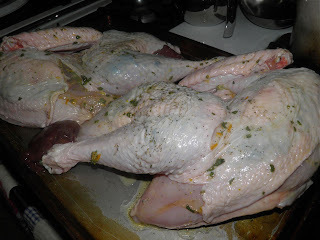 To slowly baste under the skin and make the bird flavourful I combined butter, sage and orange rind. The mixture was then massaged between the flesh and the skin. If you’re like most folks who don’t have a massive banquet table your bird probably doesn’t make it to the table whole anyway. That makes spatchcocking a very convenient option. Being tied to the kitchen takes a lot of fun out of any holiday. 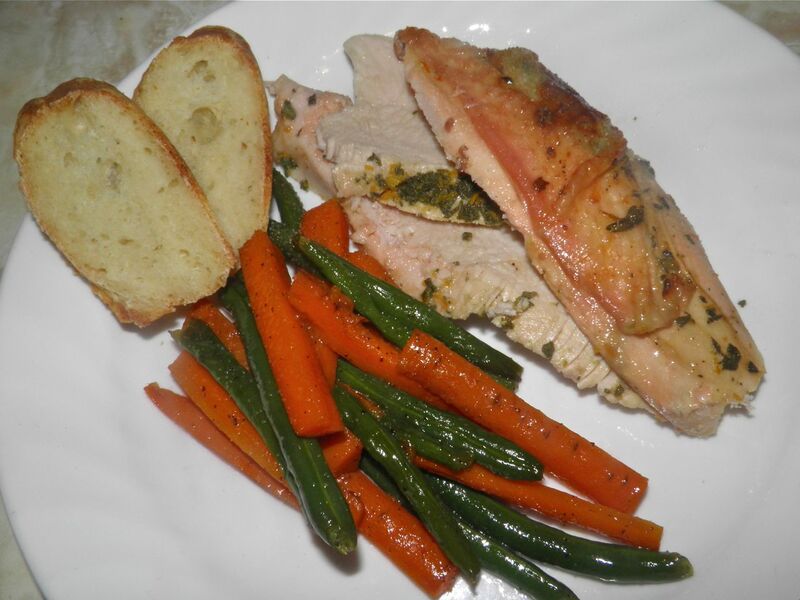 With this recipe you can cut your time in half for your Thanksgiving turkey. Enjoy your family, rather than talking to them from the kitchen door! Take out any “extras” that come inside the bird and set aside. Place your victim on a large tray or clear countertop. This can get a bit messy and you need a little room. With a pair of sharp kitchen shears cut down on both sides of the backbone from the neck to the tail. Remove and set aside with the other pieces. Trim off the first joint of each wing as well. Remove any extra skin and set it aside also. These pieces can be made into stock by simmering in water with onion, carrot, celery and herbs. If they’re meaty you could turn that stock into soup. Place the bird skin-side up and press down on the breastbone with both hands until you hear a crack. The bird will then flatten out. Loosen the skin from the bird with your fingers. You don’t have to do all the skin, just most of the breast, thigh and partially down each leg. Mix the butter, sage, rind and a little salt and pepper together in a small bowl. Spread the mixture evenly under the skin. Place the turkey in a large pan big enough to accommodate it (that was my downfall…) it flat. Take the juice of the orange and whisk it with the oil, salt and pepper. Brush the surface with the mixture, reserving any extra. Roast the bird for between 1 hour to 1 hour 30 minutes until the internal temperature reads 180°F. Test the breast and thigh with an instant read thermometer. Brush the surface of the skin partway through with the remaining basting liquid. When done, remove the turkey from the oven and let rest for 15 minutes.